The Hannah Geneser Learning Center & Safety Store is a brick and mortar representation of our Foundation's mission to make the world a safer place for children. More than 50 different safety devices are for sale at cost or below, plus trained staff and volunteers are there to help with installation/fit questions from parents. Located at Blank Children's Hospital/Iowa Methodist Campus. 1200 Pleasant Street, Des Moines, Iowa. Tuesdays & Thursdays from 9 a.m. to 4 p.m.
Wednesdays from 10 a.m. to 6 p.m. Window falls are much more frequent than you might imagine, but the danger of an open window often goes undetected until tragedy strikes. Annually, more than 5000 children go to emergency rooms after falling from windows and on average, eight children die from their injuries. Window falls are preventable if parents are armed with the right information. Hannah was a donor and Iowa’s sole organ procurement organization, facilitates both organ and tissue recovery and serve as the primary contact for organ, tissue and eye donation. 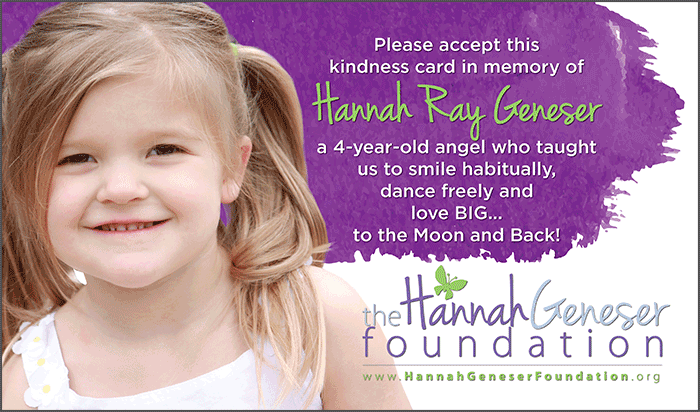 Hannah's Kindness Cards were conceived by a friend of the family as a way to honor Hannah and as a way to help us all heal. Whether it is simply a kind word, paying for the person behind you in line for a coffee or some other random act of kindness, people have embraced the concept and we have already seen the cards circle back to family and friends. It is a wonderful way to honor the memory of Hannah's love and zest for life and, at the same time, do something that helps others. Here are some helpful resources and links to help prevent any accidents with our children.